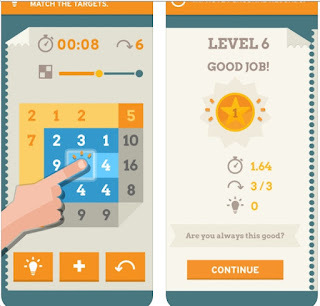 Do you remember the game Qwhizzle? I loved it! Unfortunately, it's no longer available. Hopefully, if you're a Loyal Blog Follower, you downloaded it. Recently Eljo Bosman contacted me about his team's new game: Pluszle: Brain Logic. It's another math puzzle. The object is to highlight numbers in the grid so that the selected numbers add up to the numbers on the right and the ones down below. What I particularly like is that each level can be solved in 6 degrees of difficulty. Pluszle has an excellent feature which makes this more manageable & fun: one button adds up only the numbers already selected. Another button adds up all the numbers which makes it easier to see which numbers must be eliminated. At the hardest setting, I need about 10-15 minutes. At level 5, I'm gotten my time down to 3-4 minutes. At the moment, I've done about 35 levels. 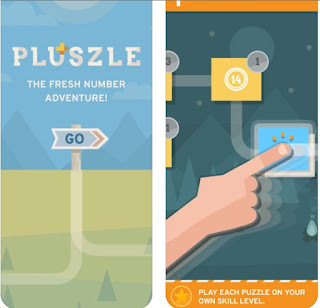 Whereas Qwhizzle had me very hyped, Pluszle has a more calm feel to it. Definitely a fun math puzzle.